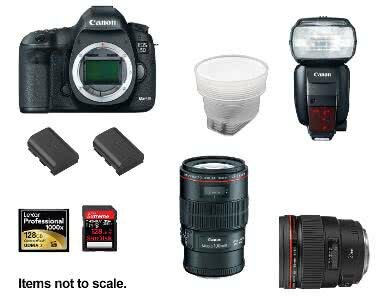 The Canon 5D Mark III Pets Pro Package includes 2 of the most often-used prime lengths for a typical pets portrait session: a normal-to-wide view for environmental scenes and a macro for small critters and closeups. Thanks to a powerful flash and versatile Lightsphere diffuser, you can quickly change your lighting style at a moment's notice. The 5D Mark III has 2 memory card slots: one for CF and one for SD. You can record to both simultaneously for instant backup or use one for overflow. The 128GB capacity allows you to capture every moment of a long session and the spare battery gives you added security. The full frame sensor on the 5D Mark III produces beautiful out-of-focus areas on wide aperture portraits and detail shots while the 6 FPS shooting speed is quick enough to keep up with all the action. This package is great not only for pets but for kids, weddings, parties, and even fine art work. • This package includes (2) batteries but only (1) charger. Prepare accordingly. • This package includes a flash that requires AA batteries, which are not included. • This package includes (2) memory cards but no memory card readers. Prepare accordingly. • There are no substitutions on packages.